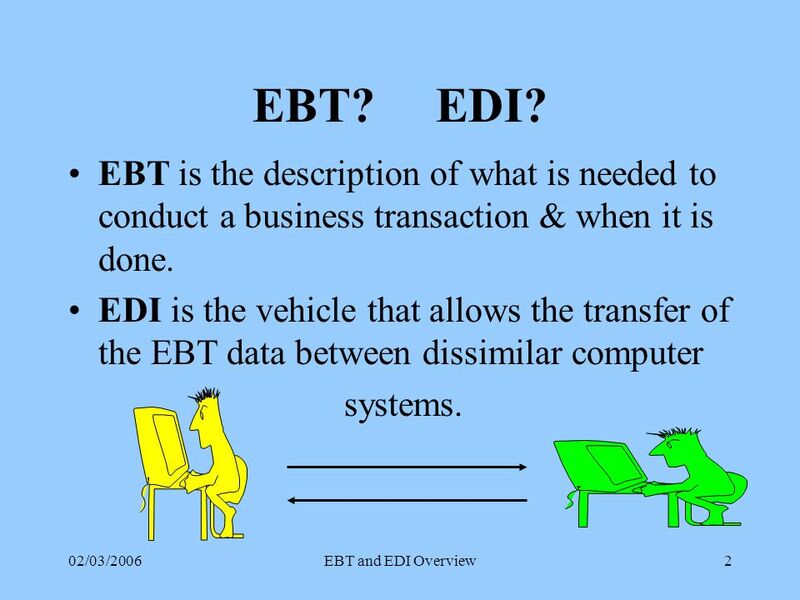 3 02/03/2006EBT and EDI Overview2 EBT? 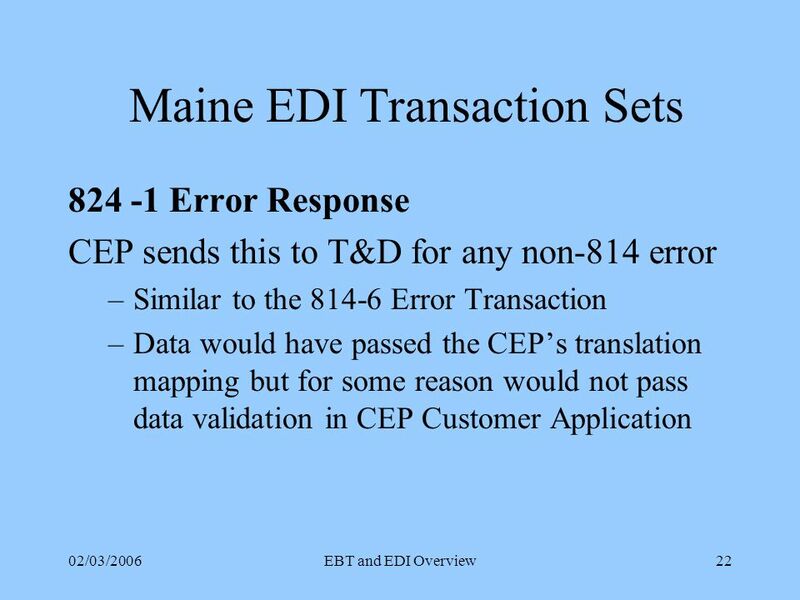 EDI? 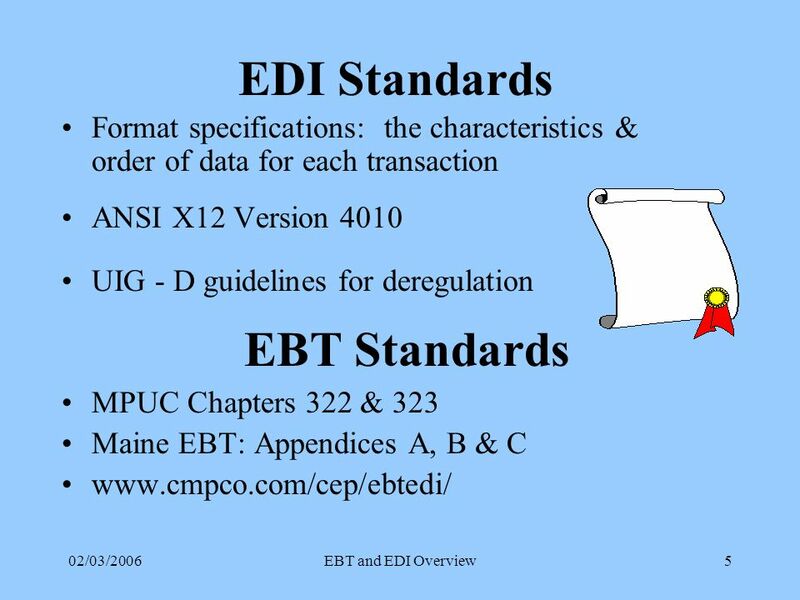 EBT is the description of what is needed to conduct a business transaction & when it is done. 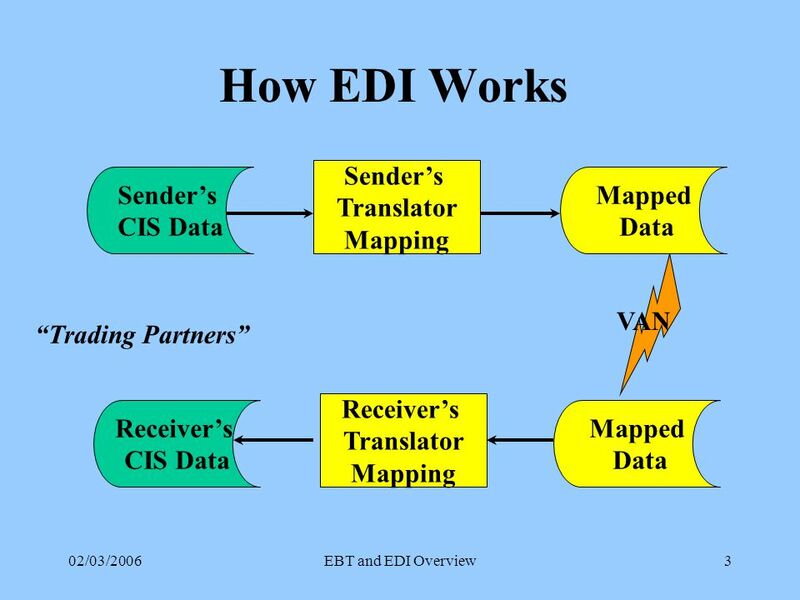 EDI is the vehicle that allows the transfer of the EBT data between dissimilar computer systems. 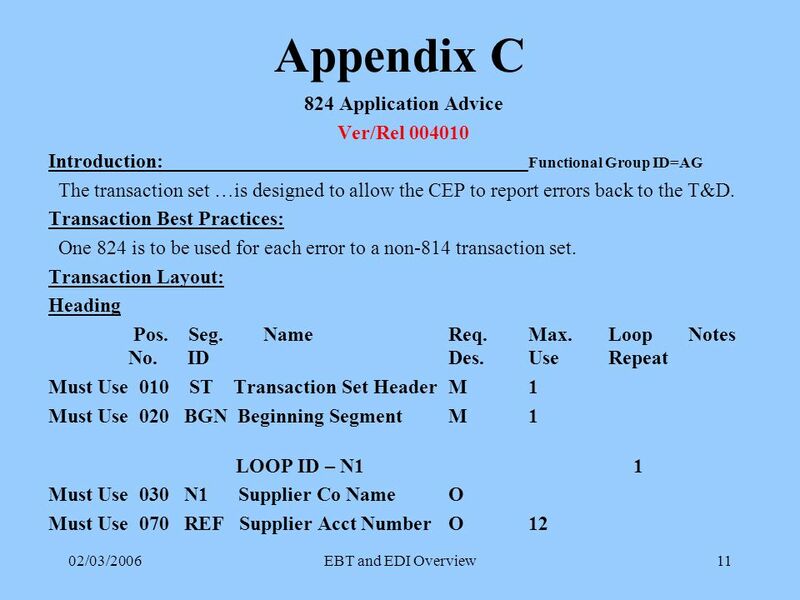 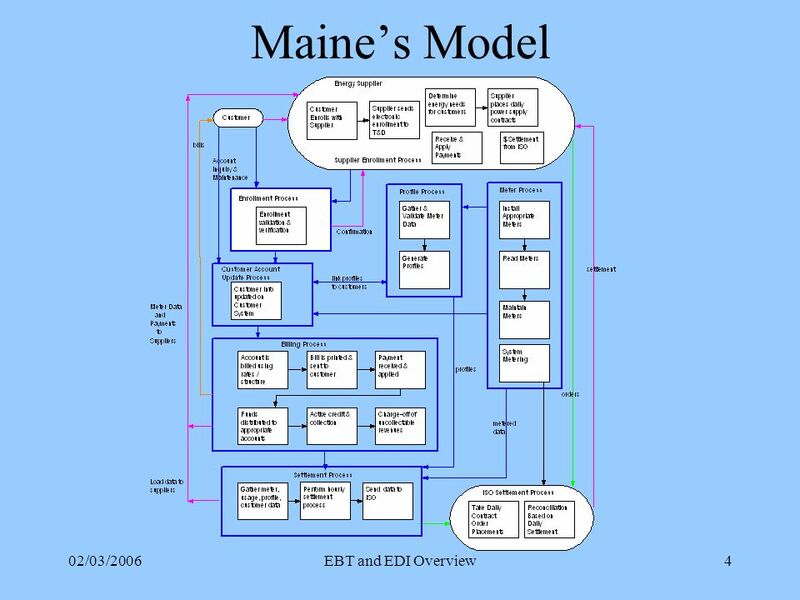 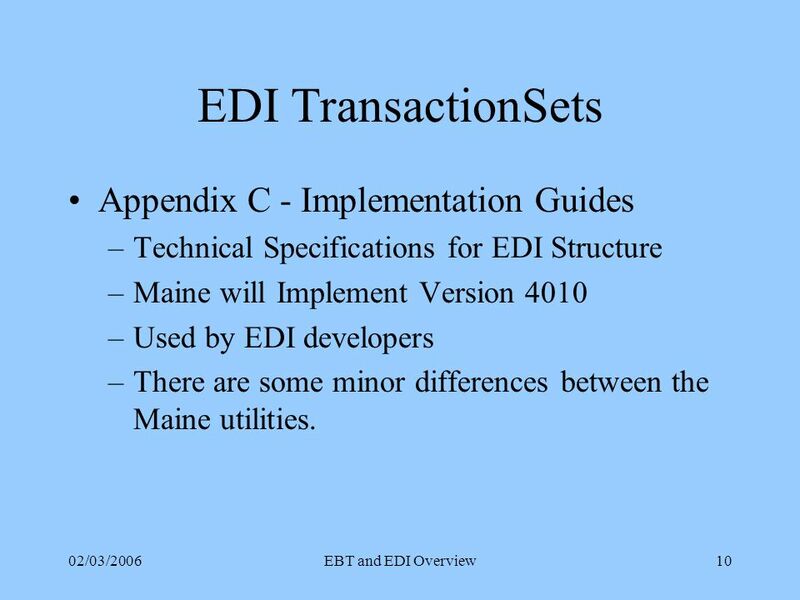 11 02/03/2006EBT and EDI Overview10 EDI TransactionSets Appendix C - Implementation Guides –Technical Specifications for EDI Structure –Maine will Implement Version 4010 –Used by EDI developers –There are some minor differences between the Maine utilities. 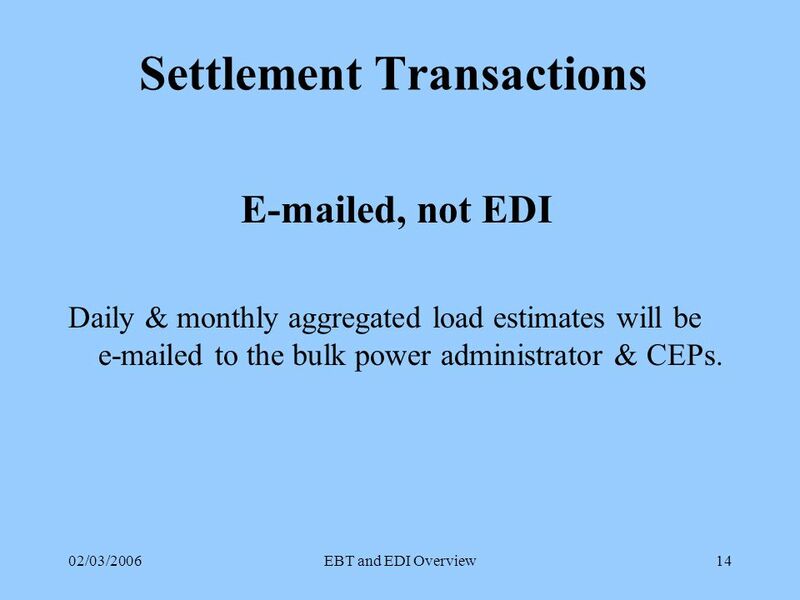 15 02/03/2006EBT and EDI Overview14 Settlement Transactions E-mailed, not EDI Daily & monthly aggregated load estimates will be e-mailed to the bulk power administrator & CEPs. 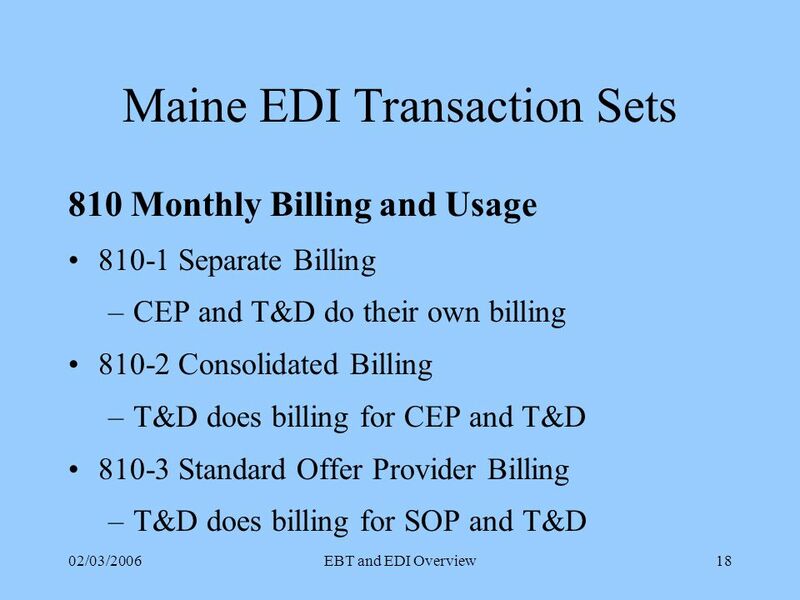 18 02/03/2006EBT and EDI Overview17 Maine EDI Transaction Sets 810 Billing & Usage Best Practices Use of the IT1 loop is used to accumulate all consumption and charge detail for a single meter or service. 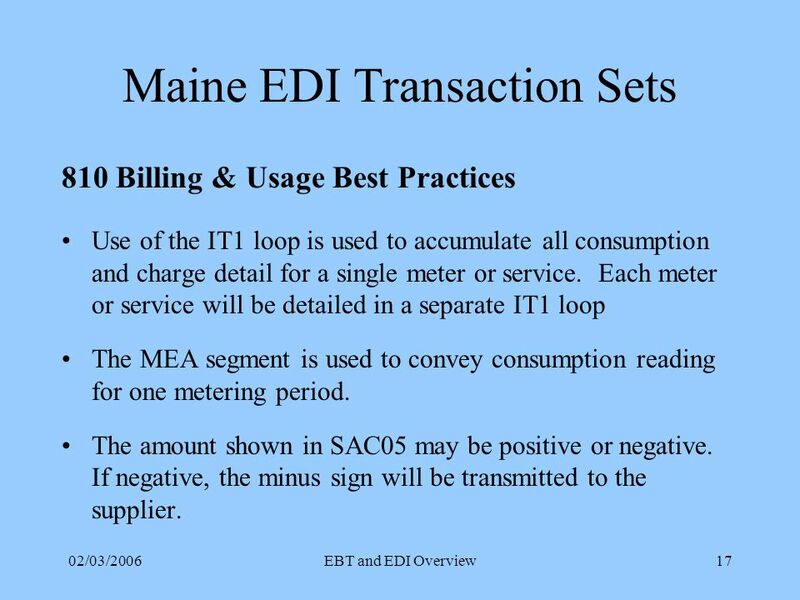 Each meter or service will be detailed in a separate IT1 loop The MEA segment is used to convey consumption reading for one metering period. 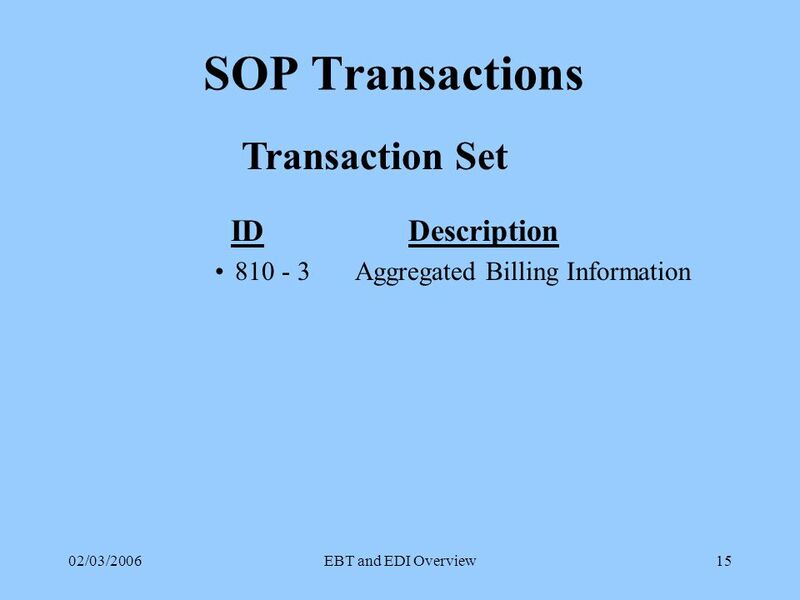 The amount shown in SAC05 may be positive or negative. 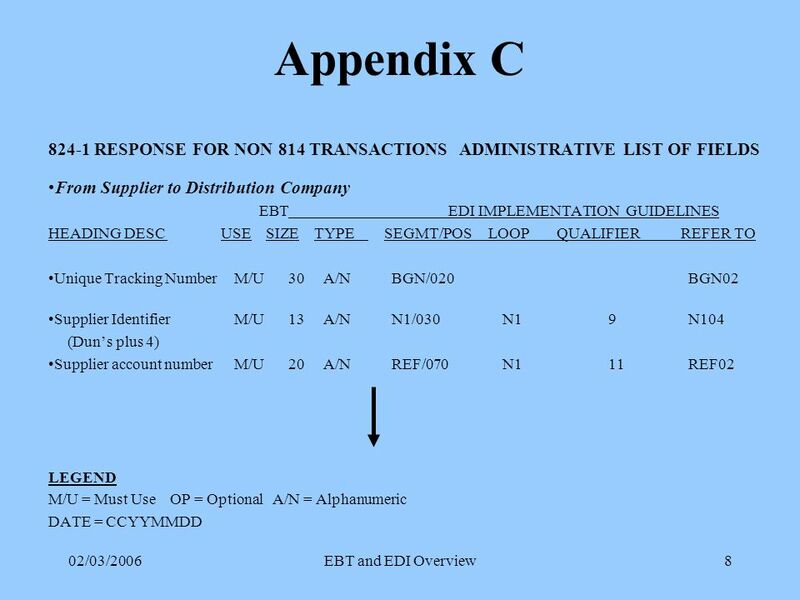 If negative, the minus sign will be transmitted to the supplier. 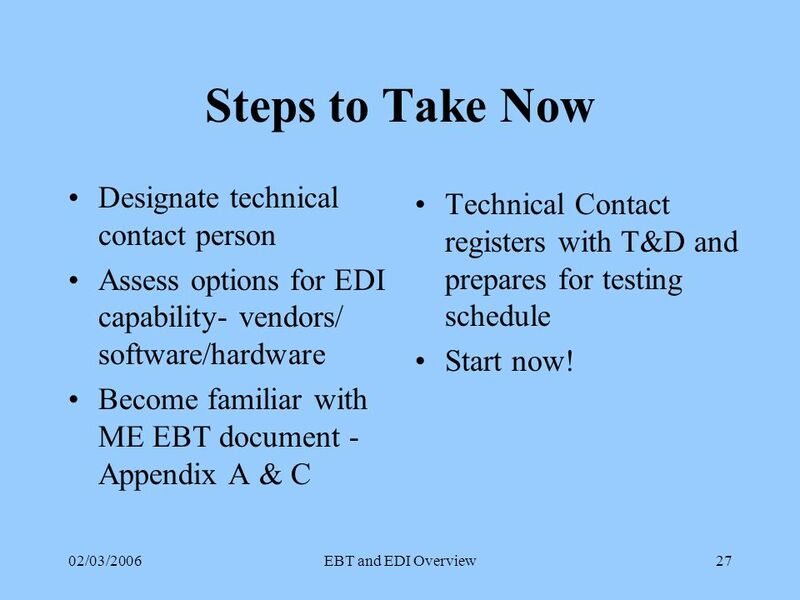 28 02/03/2006EBT and EDI Overview27 Steps to Take Now Designate technical contact person Assess options for EDI capability- vendors/ software/hardware Become familiar with ME EBT document - Appendix A & C Technical Contact registers with T&D and prepares for testing schedule Start now! 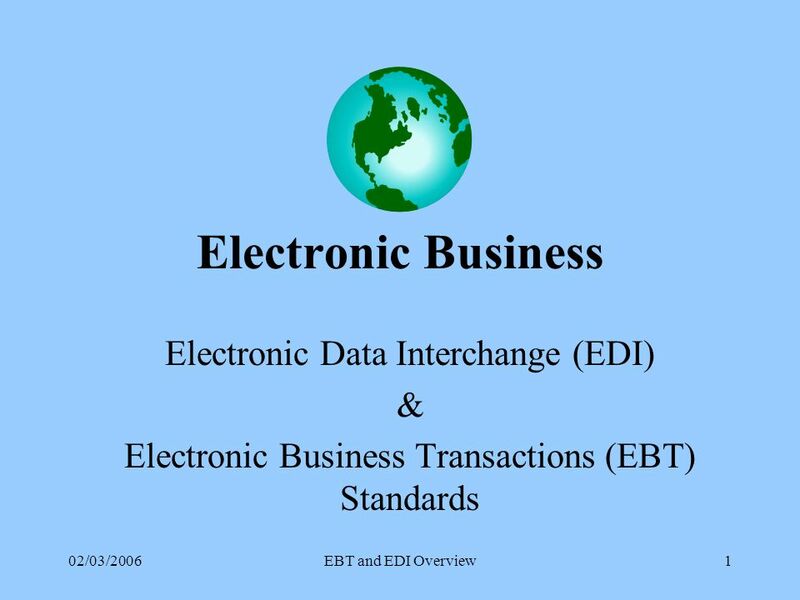 Download ppt "02/03/2006EBT and EDI Overview1 Electronic Business Electronic Data Interchange (EDI) & Electronic Business Transactions (EBT) Standards." 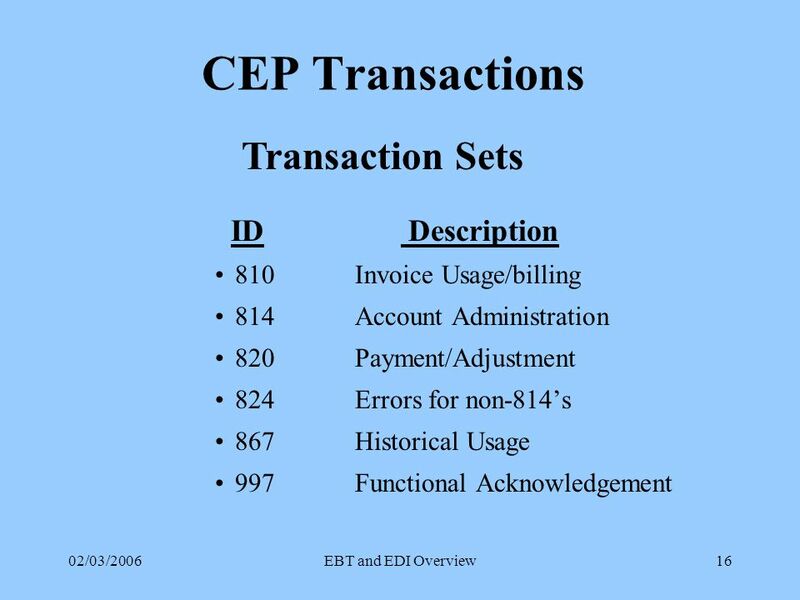 Document #06-4E Enrollment & Switching Process (via Uniform Electronic Transaction) Customer Supplier Distribution Company Customer authorizes enrollment. 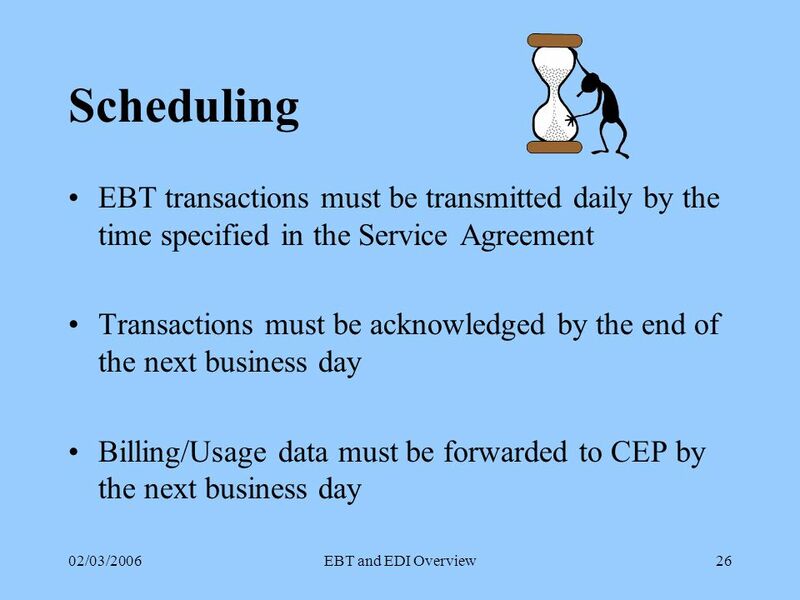 Dual Billing Process Flows (Model Business Practices 2.2.3) Distr. 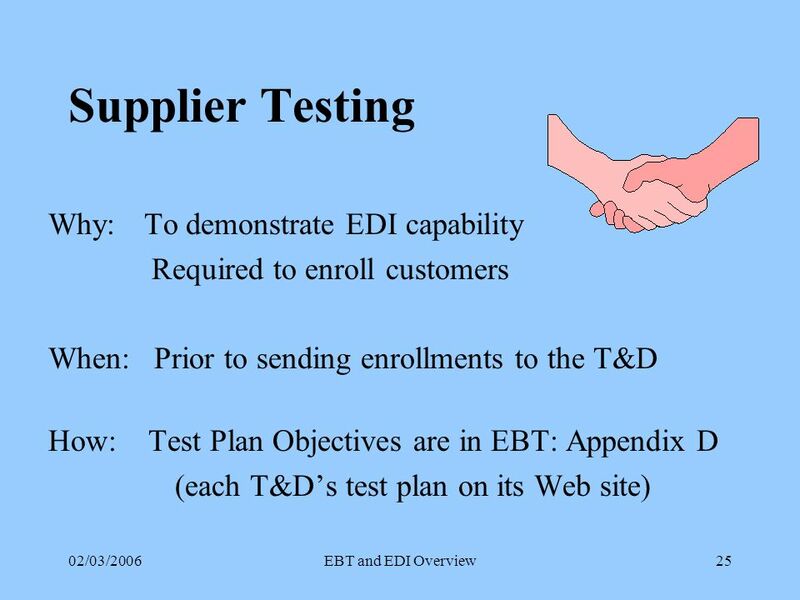 Company Supplier Customer Mtr. 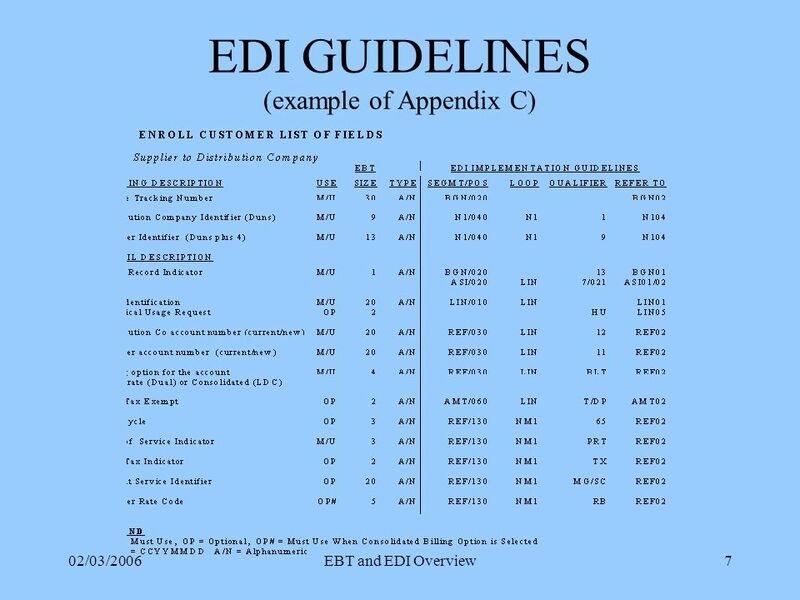 Rdg Entity Distribution Company prepares and renders. 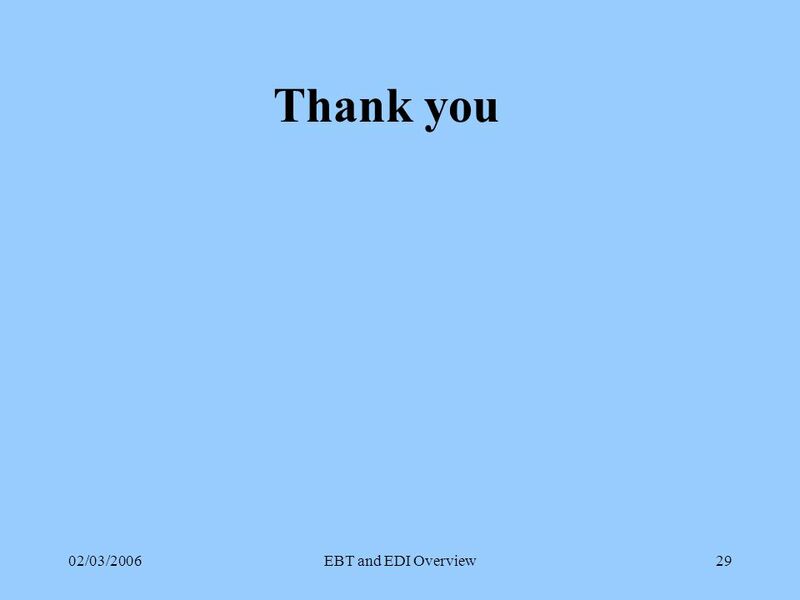 AGENCY Relations. 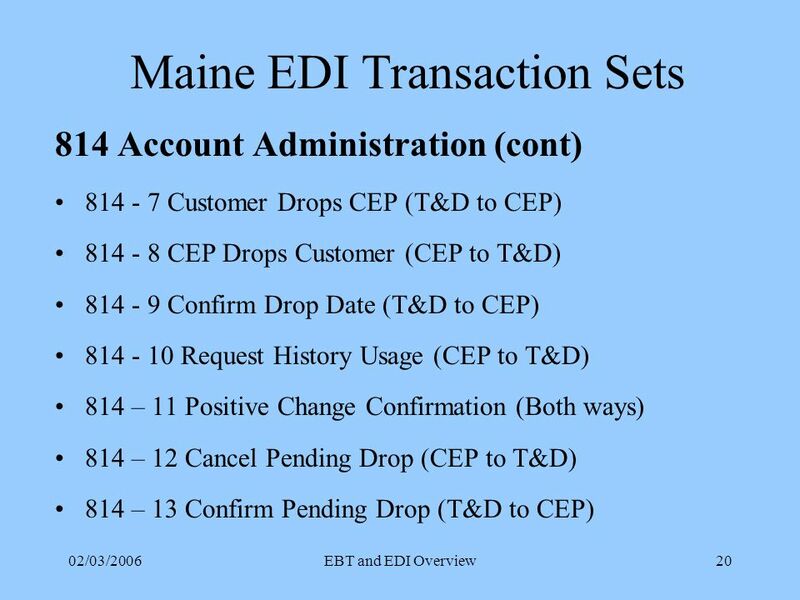 Topics to Discuss Adding a new agency Contacts and Address Information Parent/Program Relationship Accounts Receivable Agency Correspondence. 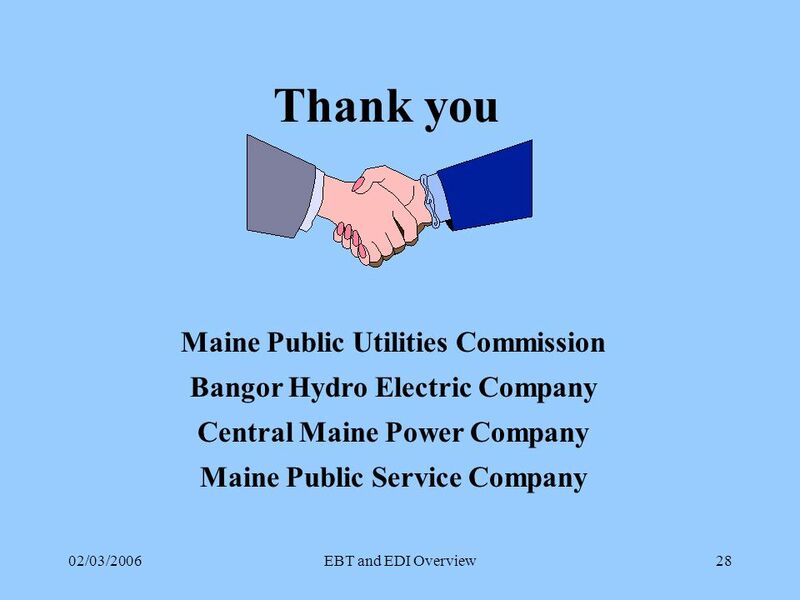 Summary of Customer Service Rules for Low-Income Electricity Customers Paul Gasparatto Policy Advisor. 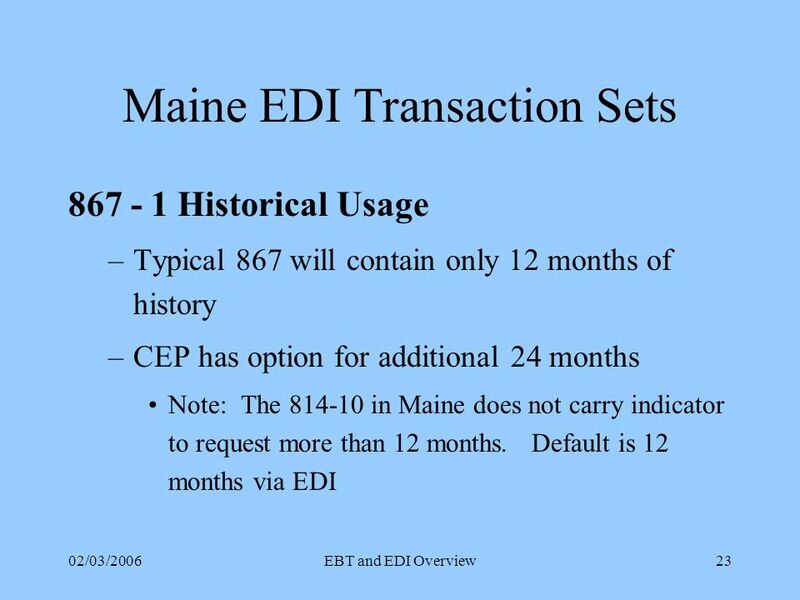 A more efficient you. 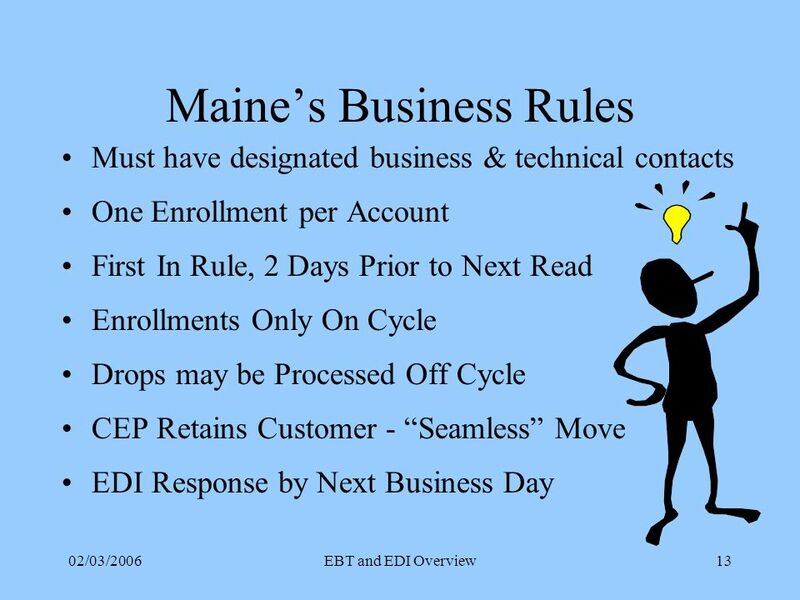 Introducing EmployerAccess Anthem’s easy-to-use online benefits management system Anthem Blue Cross is the trade name of Blue Cross. 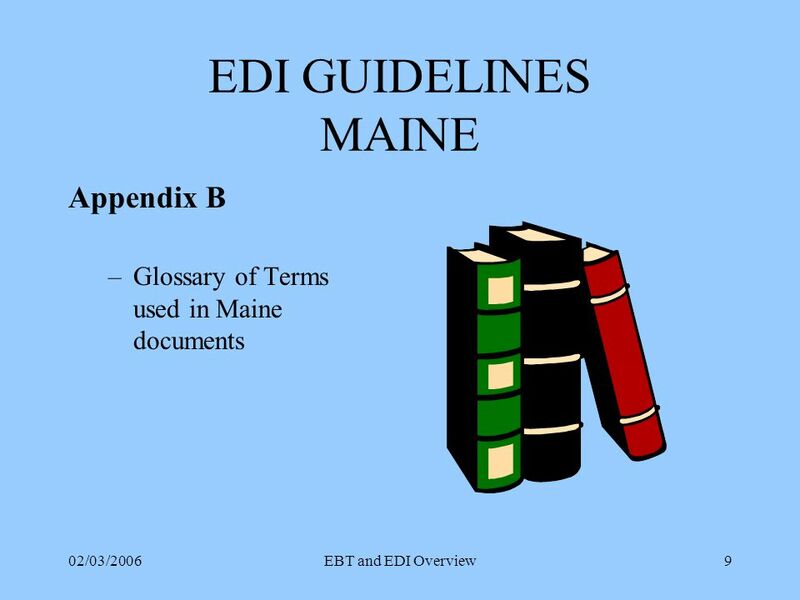 Journal Entry Guidelines. 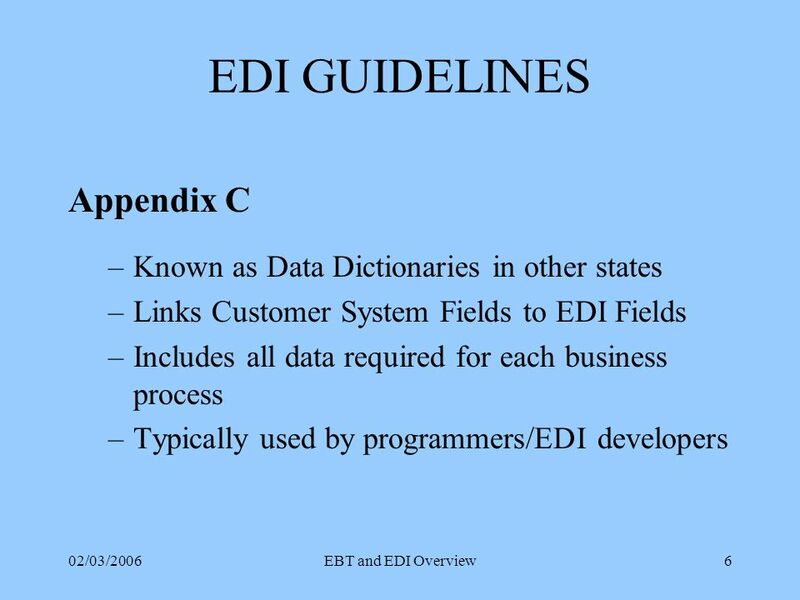 Common Definitions Journal Entry Guidelines Journal Entry Preparation Documentation OBJECTIVES. 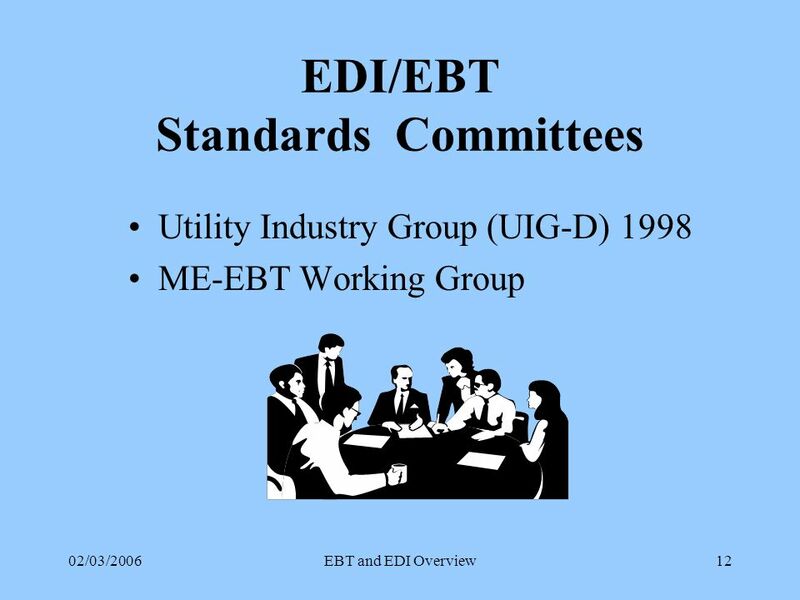 Energy Industry EBT Solutions & Services Systrends Intl. 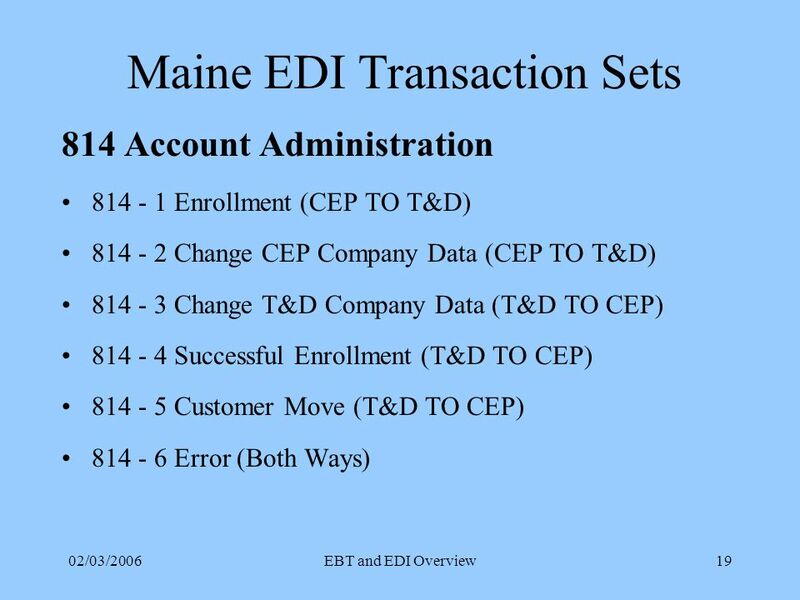 Transaction Fee Reporting System User Guide for Non-State Term Contract and Non-State Purchasing Agreement Vendors. 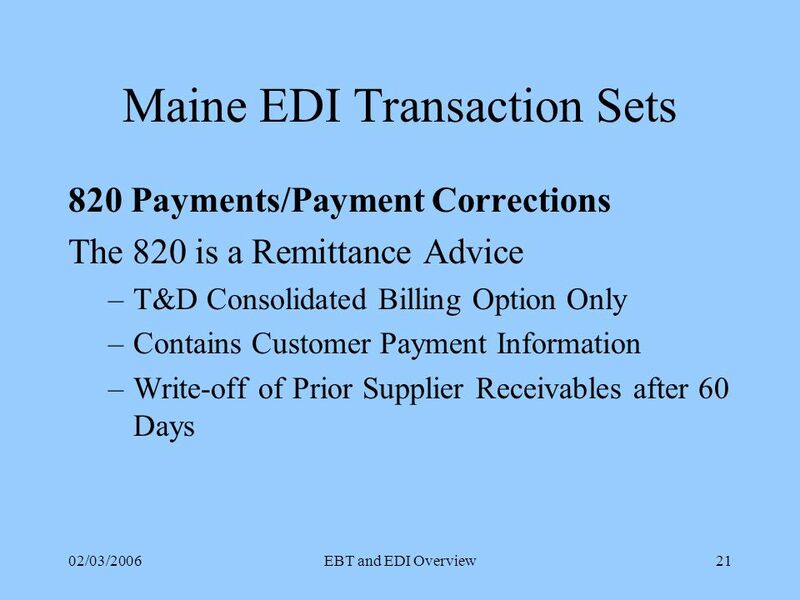 E-invoice for consumers Information in brief for invoicers February 2007. 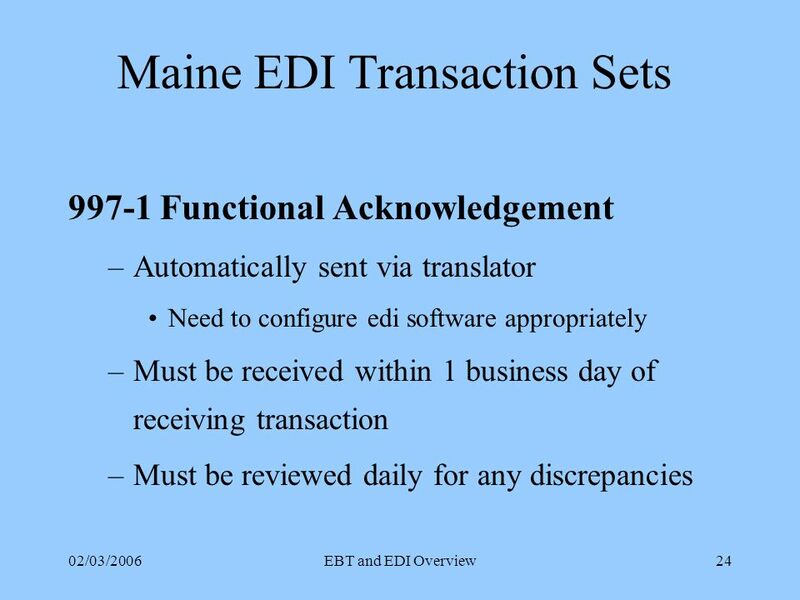 EDI Future Environment Initiative Project Kickoff 12/15/2004 Corporate Information Technology.